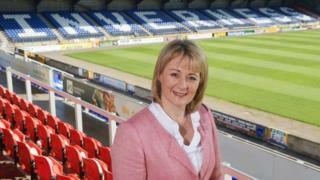 Yvonne Crook has resigned as Inverness Caledonian Thistle FC's chief executive after 10 months in the role. The businesswoman was appointed to the post after previously advising the Championship club's board over a period of six months. Caley Thistle's chairman Graham Rae said it was with regret that the board had accepted her resignation. He said the club wished Mrs Crook well in "whichever direction her future career takes her". Mr Rae said: "Mrs Crook was an energetic and creative lead officer for the club. "Her tireless efforts to run the business and attract new investment were greatly appreciated by directors of the club, who collectively wish her well in whichever direction her future career takes her."